Created in 2002 as one of the critical design elements of integrated planning, the academic priorities fund (APF) supports major strategic change initiatives that result from the University of Saskatchewan’s integrated plan. The APF is used by the provost’s committee on integrated planning (PCIP) to fund specific projects, innovative ideas and programs in the plan’s priority areas, with a focus on supporting the academic mission of the university. 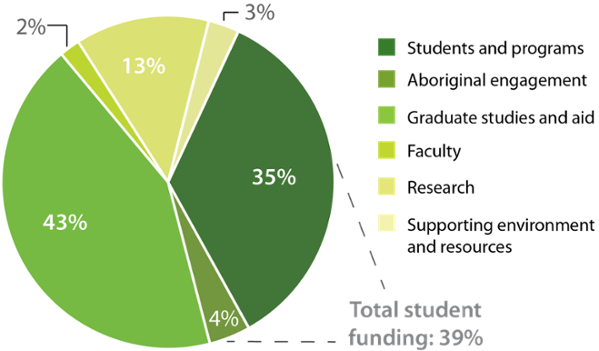 The fund represents less than two per cent of the university operating budget. Since its inception, over 150 initiatives have been supported by the APF. Initiatives in the colleges/major administrative units which aligned with the university’s priorities identified in the integrated plans. A portion of the APF is set aside to provide one-time, annual with conditions, cyclical and permanent support to specific initiatives approved as part of the college/major administrative unit planning process. Institutional level, college and/or major administrative unit initiatives directly arising out of or supporting any one of (or several) of the foundational documents. A portion of the APF is set aside to support the foundational documents, i.e. the key planning dimensions in the first, and subsequent, integrated planning cycles. $4.5 million in permanent funding has been set aside for the third integrated plan. To the extent funds are held before they are permanently allocated, the APF also represents a pool of funds for investments in selected projects and innovative ideas on a one-time only or term basis. Permanent budgets of nearly $3 million in first integrated plan, $4.5 million in second integrated plan and $4.5 million in third integrated plan, combined with funds from the discontinuation of some initiatives, has allowed the university to invest nearly $11 million dollars in permanent funding since the inception of the APF in 2002/03 to the end of 2013/14. Accumulated surpluses have been used to provide support when one-time or funds over a limited term are required. To date, the APF has provided over $47 million in one-time funding. One Health has been defined as “the collaborative efforts of multiple disciplines working together locally, nationally and globally to attain optimal health for people, animals and the environment (AVMA 2008)." In 2011, the University of Saskatchewan identified One Health: solutions at the animal-human-environmental interface as one of six signature areas of research and scholarship. The U of S currently has significant strength in the area (established interdisciplinary research teams, VIDO-InterVAC, NSERC CREATE Training Program in Infectious Disease, food safety and public policy) and emerging opportunities (Network of Centres of Excellence in One Health). Funding provided was specific to facilitating the formation of interdisciplinary research groups, expand the NSERC CREATE-funded graduate program to include an international dimension, and establish graduate and undergraduate certificates in One Health. This initiative supports institutional incentive structures for cross unit, interdisciplinary activity, and enhanced strategic research focus at the university by strengthening SENS’ role as a link between signature research initiatives, institutes, colleges and schools. Funding expands scholarship opportunities for students, and allows for new faculty and staff positions to support the growth of the school. To support the teaching and learning of the Cree language, PCIP provided permanent funding for an academic programming position in the College of Arts and Science. By supporting the development of proficiency in Cree, this position contributes to greater understanding of Cree culture and history, facilitates student and faculty research partnerships with Cree speakers, and expands opportunities for the understanding of indigenous knowledge. Transforming student advising (phase 2) builds on the PCIP-funded phase 1 academic advising reforms that, since 2010, have seen additional college advisors hired (including specialized Aboriginal student advisors), new training procedures for staff and student-friendly DegreeWorks software introduced, and the university advising council established to help coordinate and spread these reforms across campus. Phase 2 funding is intended to bring student advising capacity in line with U15 peers in terms of quantity, and allow for innovative reforms to make us a qualitative leader nationwide. The matching grants program enables the Office of the Vice-President Research to provide financial contributions to support faculty in their pursuit of major national and international funding opportunities, and in particular the large collaborative and inter-institutional programs sponsored by the federal research granting councils. 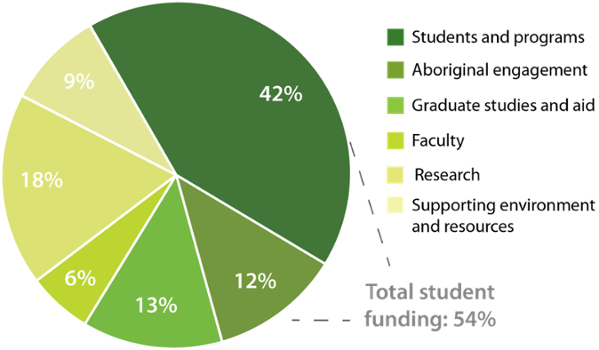 For many of these highly competitive programs, financial contributions from institutions and partner organizations is a requirement and the absence of financial support is viewed as a lack of institutional commitment to the research initiatives. The matching grants program is a key factor in the success of our researchers in challenging competitions. The ICCC fosters creative, engaged scholarly activity that is anchored in and reaches across and beyond the disciplines of Humanities and Fine Arts by 1) supporting creative research and artistic creation that is culturally relevant and imaginative; 2) enhancing opportunities to teach new ideas in new ways; 3) creating an intellectual environment that models creativity, collegiality and collaborations; and 4) engaging with communities in scholarly and teaching partnerships to co-create knowledge that is mutually meaningful and enriching. Administered by the Gwenna Moss Centre, the encourage excellence in teaching awards recognize excellence in teaching within each college and in Aboriginal, international and graduate education, as well as outstanding teaching innovations, new teachers and graduate student instructors. Along with the permanent commitment to these prizes, a small amount of funding is devoted annually to scholarship of teaching and learning seed research projects and to maintaining involvement in the Bay View Alliance, an international consortium of universities promoting evidence-informed teaching practices. The University of Saskatchewan is in the process of implementing a research management enterprise system that will transform the way support is provided to faculty and administration. This single, web-based system will provide opportunities for the campus community to collaboratively manage research projects securely, and will serve as a central repository from which other systems can draw information about research projects at the university. It is intended to support the life cycle of a research project and complement the needs of researchers, research administration, and compliance and reporting requirements for the university. With a mix of programming and services, these set of cross-unit initiatives target two priority areas: curriculum innovation, and aboriginal engagement and community outreach. Together, the academic innovation initiatives form a strategy of broad support for innovations in academic programs, research and support services at our university. Through these initiatives, the university supports a concentration of expertise that faculty members and academic units can call upon to support the development new forms of learning in our curricula, and which bridge the traditional boundary between learning and research, including experiential learning, problem-based inquiry, community and Aboriginal engagement, internationalization, sustainability, distributive education and technology-enhanced learning.